Pain isn’t just something to get rid of — it’s your body saying something is wrong. Pain triggers inflammation at the point of injury. This alerts your immune system to work on healing. Other body chemicals then rush in to fight infection, destroy dead cells, and keep the inflammation in check. For most injuries, pain goes away with treatment and time. When it doesn’t, many get caught up in a long-term doctor’s prescription. But those powerful opioid painkillers have led to an epidemic of overdoses and addiction. More than 14,000 Americans died of opioid overdoses in 2014, and even more in recent years. Real Pain Relief. Are you in pain? REAL pain relief starts with listening to what your body is saying, then looking for the cause. You could go to the doctor for a prescription, but this does not address the cause of your pain. If you’re in pain, don’t just ignore it – take action. If you have already tried the conventional prescriptions, there is another solution you might want to consider – dialing the pain down using some more natural methods. (2) Audio brainwave trainings that settle your brain into more healing brain frequencies. Brainwave trainings are a newer solution to pain. They are typically configured by a professional, and are designed to drop your brain into deeper, slower brain frequencies. Guided relaxation CDs are designed to drop you into a state of suggestibility and relaxation. If done properly, then also contain softly spoked messages that help you learn to better manage your pain. 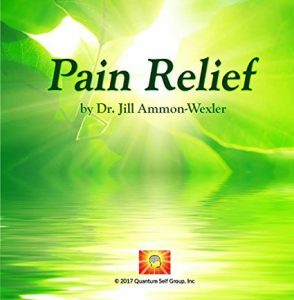 The author, Dr. Ammon-Wexler, is a 47-year expert in both guided relaxation and brainwave training for pain relief. Her latest CD focuses on brainwave training for both acute and chronic pain. A guided relaxation meditation spoken by Dr. Jill. A softly spoken meditation by Dr. Jill to help you reduce your pain. Soft guitar leads into gentle softly spoken subliminal cross-phonic healing suggestions. High to deep Delta brainwave-engineered sounds proven to reduce hypertension. Relax and use stereo headphones. Designed to ease headaches. Embedded soft subliminal cross-phonic relaxation suggestions. Close your eyes. Shopping on Amazon is totally safe!